"It is hoped that better disease management and control will eventually lead to sheep scab freedom in Wales"
An industry-led group is calling on the government to provide funding to help eradicate sheep scab in Wales. The call from the Welsh sheep scab industry group comes in response to its report (published 7 November) which makes a number of recommendations for the control of the disease. Compiled by farming unions, veterinary practitioners and industry stakeholders, the report recognises the need for treatment to be coordinated across neighbouring premises. 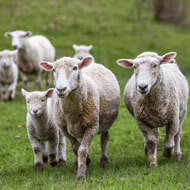 Sheep scab is an insidious disease that has serious welfare implications for infected sheep. Previous attempts to eradicate the disease have had limited success, in part due to treatment plans which have attempted to control the disease on a farm-by-farm basis. The group says that, if funded, it would put a sheep scab control programme in place which would increase the chance of neighbouring farms working together to eliminate this disease. The National Sheep Association, which helped compile the report, said: “It is this fresh perspective on the disease that makes the recommendations within this industry-led report a more holistic and workable approach to disease control. It is hoped that better disease management and control will eventually lead to sheep scab freedom in Wales.